Twiddla is an online platform that bills itself as one of the easiest online collaborative tools in existence. And, by many measures, Twiddla does meet its goal of maintaining a simple user interface. Twiddler was launched in 2007. A blog is maintained on the website, with updates to the tool. Twiddla allows users to collaborate in real-time on a virtual whiteboard. Users can choose to upload images, text, websites, or drawings. No plug-ins or special downloads are required to activate Twiddla. One need not be a registered user to start or join a collaborative Twiddla meeting. Real-time chat and voice functions are made available across all free and paid user tiers. Unlike some of its peers in the community-centered online tool universe, Twiddla does not require users or collaborators to register. Those users who need assistance, however, cannot access live help in real time. Users must e-mail the help desk and wait for a resolution. Twiddla adopted a subscription model. For those who choose to sign up, users can choose a tier based on their identity (e.g., casual users who needs to communicate with clients; freelancers/consultants; small teams; people in suits; the big time people). While on the surface, user categories seem to cater to business types, Twiddla’s blog emphasizes its utility in the classroom. Twiddla meets the ISTE standard for global collaboration, given the limitless number of users who can participate in multiple formats: text, voice, and drawing. The learning curve in mastering Twiddla is not steep. Clickable icons, graphical displays, and embedded windows are intuitive and visually appealing. A significant plus is Twiddla’s ability to allow users to incorporate symbols used in mathematical computations. Twiddla is owned by Expat Software, a firm that employs four workers (including the CEO). Only an e-mail address is provided for contact. There is no phone number or mailing address listed in either Twiddla’s or Expat Software’s website. It is unclear how long uploaded content is maintained on Twiddla’s servers. Twiddla states that it will not share uploaded content with third parties. However, Twiddla also discloses that those terms may change if it is bought by another firm. Several years ago, Google had expressed interest in Twiddla, but later decided against the purchase. Twiddla’s terms of service states that the owners are not responsible for the content uploaded to their servers. There is no mention of COPPA or SOPIPA laws, which is intended to protect websites from collecting information from users 13 years old and younger without consent from a parent or guardian. Twiddla has the potential to increase tech equity among students. Students who live in rural areas, with limited access to tutors or peers who share similar extracurricular interests (e.g., Math Club), can benefit greatly. Twiddla enables rural students to have access to real-time collaboration, mentoring, tutoring, and problem-solving. Substitution: Twiddla eliminates the need for students to draw the stages of mitosis, for example, on paper and submit. Instead, students can draw and make quick revisions on the mitosis process using Twiddla. Augmentation: Twiddla allows for real-time collaboration without users having to physically meet in person. Modification: Collaboration via screen sharing is enhanced by the inclusion of real-time text chatting and voice-to-voice communication. In addition, collaboration is not limited by geography. Twiddla enables users anywhere to join in and participate. Redefinition: Twiddla’s multi-modal abilities allow for seamless collaboration both synchronously and asynchronously. Participate in a math challenge with student teams at different sites; a panel of judges can evaluate all work posted to the Twiddla whiteboard and assign points accordingly. Twiddla has the advantage of having many math symbols and geometric graphing options available. Students learning a new language can annotate text collaboratively, highlighting verb forms, tenses, modifiers, etc. Students can jointly critique a visual display or advertisement. Principles of visual communication can be assessed, with students marking up images to show evidence of eye gaze, graphic misrepresentations, etc. 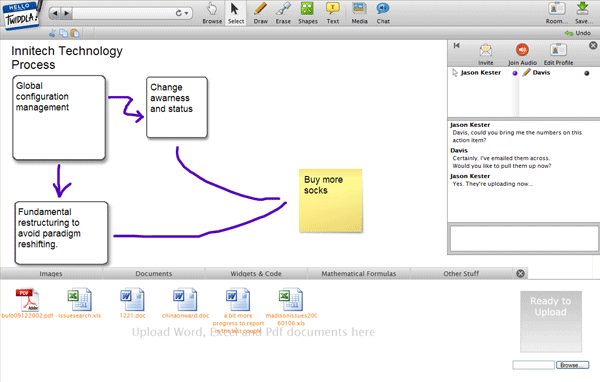 The EtherPad function within Twiddla allows all users to write, edit, and revise text-based documents in real time. (Note: If EtherPad is not enabled, the Twiddla host needs to designate which users could have full access to the whiteboard.) Journalism students can watch a live streamed event and using EtherPad can collaboratively write a news story. Move Over PiratePad–I Just Found Twiddla! Users can elect to create a free account (or not). On the home page, find the green button marked “Go” and click on it. 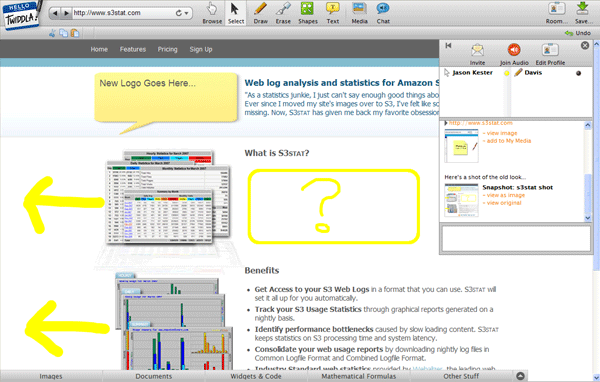 A whiteboard is launched within the browser. The Twiddla host can now upload images, documents, etc. A unique URL is also provided on the right hand of the screen. This URL can be shared with all collaborators to join in real time. To enable EtherPad (which allows all users to have full control of the whiteboard), click on the icon labeled EtherPad. To enable voice to voice communication among users, click on the red icon labeled Audio. Speak into the computer’s microphone to ensure others can hear. To begin real time text-based chat with all users, type inside the dialogue box that appears on the right side of the screen. To save a snapshot of the whiteboard or a transcript of the chat, click on the “Save” icon which appears on the upper right hand corner of the whiteboard. Only registered users are permitted to save their work as a PDF file or on Twiddla’s cloud. Santarosa, L. M. C., Conforto, D., & Machado, R. P. (2012). Whiteboard: Synchronism, collaboration and accessibility on Web 2.0. Computers in Education (SIIE) International Symposium, 1-6. Santarosa, L., Conforto, D., & Machado, R. P. (2014). Whiteboard: Synchronism, accessibility, protagonism and collective authorship for human diversity on Web 2.0. Computers in Human Behavior, 31, 591-601. Twiddla allows for seamless collaboration between teachers and students. Twiddla is an online tool for students and learners that to use a digital whiteboard for collaboration. A basic plan is free, with more advance options available for a fee. Users can collaborate and make changes to images, text, drawings, and even math equations.